United executive director Adam Pearson had been attempting to negotiate a settlement following the breakdown of Redfearn’s relationship with owner Massimo Cellino. But in a statement, Redfearn said: “It is with great sadness that I am resigning from my employment at Leeds United with immediate effect. 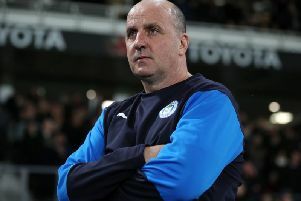 Redfearn finished last season as United’s head coach, managing the first-team squad in a period when Italian owner Cellino was banned from running the club by the Football League, but the Italian chose to replace him with Uwe Rosler after regaining control of Leeds at the start of May. Redfearn’s contract as head coach gave him the option of returning to his old job as academy boss, a position he first took up in 2012. Cellino, however, attacked Redfearn in a national newspaper interview on May 18, describing him as “weak” and of behaving “like a baby”. Cellino accused Redfearn of attempting to turn the club’s supporters against him during a fractious end to last season. Despite that, Redfearn was absent from the club throughout the summer and has not been present at Thorp Arch since the Rosler’s squad began pre-season training at the start of this month. Cellino is understood to have pushed a parting of ways following their public and bitter fall-out and talks about a severance package continued for a number of weeks. The failure to agree a settlement is likely to see Redfearn bring legal action against the club. The former Barnsley midfielder leaves United after more than six years as a coach at Thorp Arch. He joined the youth-team staff in 2009 before becoming academy head in 2012 and head coach last November. He also acted as caretaker manager on three occasions. Redfearn’s statement read: “I would like to place on record my thanks to everyone connected with the first team, including the fans, for making last season both productive and beneficial after a difficult start. “Very importantly, I would like to pay a special tribute to the academy where I proudly worked along with others for the best part of six years. United have been approached for comment by the YEP.